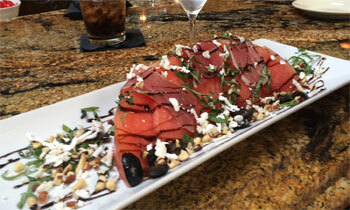 This summer we are featuring our Watermelon and Proscuitto Appetizer. Watermelon and Prosciutto are combined with Hazelnuts, Feta cheese, Black Olives, Basil and Aged Balsamic vinegar to create a refreshing and savory start to a great meal. Hurry down and see us soon to enjoy this and the other exciting dishes we have on our menu.